If you search for pumpkin brownie recipes, you’re likely to find a brownie to which someone added 1/2 cup of pumpkin and called it a day (a good day, mind you, because I like that version of brownies just fine). But, let’s be honest, we can add pumpkin to brownies all day long and the chocolate will take control every time. What I wanted was pumpkin flavor.That meant blondies. And that is how these Gluten Free Pumpkin Blondies with Pumpkin Fudge Topping came to be. These babies are good. And when you pour on the Pumpkin Fudge Topping, well, good gets better! (Unless you don’t eat chocolate, in which case you’d better leave off the topping. Either way, you’re going to end up with that happy tummy feeling, promise!) You can serve these a little warm, or at room temp, and let the topping drape over the squares like in the picture. OR you can chill the blondies and the topping (separately, of course), then, spread the topping on – it becomes thick like frosting when chilled. I would show you a picture of that, but that was breakfast one morning and it was far too early to think about a photo. Trust me, though, it was delish! 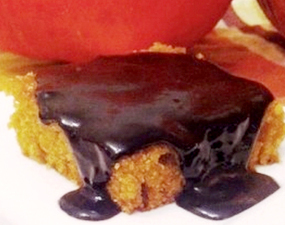 This recipe is free from: gluten, dairy/casein, soy, peanuts, tree nuts, corn. In a mixing bowl, combine oil, sugar, vanilla; stir until sugar begins to dissolve a bit. In a separate bowl, whisk flour, soda and salt, then add to pumpkin mixture, stirring until no dry ingredients remain visible. Spoon batter into prepared baking dish. Set topping aside until ready to use. For thick, frosting-consistency topping, refrigerate 30-45 minutes before using.